I swear, it’s not a review… No but seriously, I am not going to get in depth or too technical with this article, I just want to mention this awesome product. I had a few criteria’s when looking around for this product; I wanted it to be truly wireless. I also wanted it to be rechargeable; I don’t want the hassle with buying and changing battery’s. And last but not least I wanted as good sound quality as possible but still be able to fit it in my backpack. Most of the really tiny pocket sized alternatives sound just like that; tiny, so I ended up looking at the slightly larger alternatives where the selection gets a bit narrower. 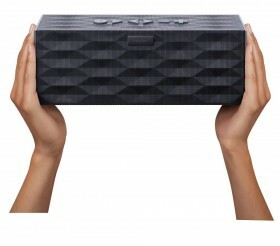 I ended up getting the Jawbone BIG Jambox, which is pretty big for a mobile speaker but still very much portable. The BIG Jambox currently retails for about €250 which might scare off the average casual consumer, but let me tell you, the BIG Jambox destroys competition completely. Keeping in mind that the BIG Jambox is truly wireless, portable and relatively small, it delivers a huge sound stage and can play pretty loud. Even though the bass won’t knock the wind out of you, it definitely packs a good punch for its size. The build quality is really impressive and the whole device is covered with a protective metal mesh and feels very sturdy. The battery lasts for around 15 hours of listening time and the BIG Jambox pairs up with any bluetooth capable device. I have used it with my iPhone, iPad, MacBook Pro and my PC for music and movies and it easily fills up a normal size room with maintained sound quality. If you’re in the market for a powerful bluetooth speaker, this is it! For more information about features and specifications, please visit Jawbone’s website on the link below. 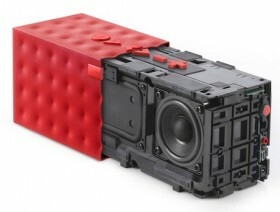 Here’s a video where they do a teardown of the BIG Jambox.